1. Full floor-length underskirt and fitted bodice of an iridescent red-gold/bronze silk or silk-like fabric, and long fitted sleeves of a sheer crisp netting or organza in a flesh tone color. The bodice, sleeves and skirt have an overlay of thick heavy matte lace in an uneven, spider-web like pattern. The skirt should have some structure and not be limp. 2. 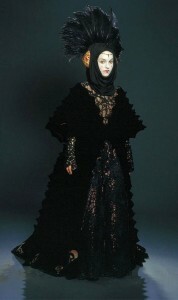 Full floor-length overskirt and moderate train of black velvet or velveteen, with large and small Naboo symbols in a red-gold/bronze color along the hem and up the center back of the skirt. No panne velvet. 3. Semi-fitted, long coat of a black matte fabric with an all-over cone-like texture that has some body and structure (medium-weight wools and velvets/velveteens are suggested). The coat have a deep V-neckline to the waist both front and back, elbow-length full sleeves lined in the iridescent red-gold/bronze silk or silk-like fabric, and asymmetrical hems reaching to mid-calf. The center back of the coat has a long, wide strip of black satin and lace appliqué encrusted in black seed beads and sequins. 4. Full fitted cowl of a black matte silk or silk-like fluid fabric that encircles the face closely with draping that reaches the waist at the back. The covers an inner structure to which two red half egg shapes covered in thick “drizzled” gold filigree, one over each ear and a very tall full plumage of black ostrich feathers at the crown of the head. At the forehead is a small chain of ruby rhinestones with a small inverted triangle of ruby rhinestones. The cowl is also very sparsely dotted with tiny ruby rhinestones at the top of the head and temples. The hair should be completely covered by the cowl.